Spicy Buffalo Salmon — Pip and Ebby - easy, delicious recipes! Spruce up your salmon with a savory buffalo sauce! Turns out great baked or grilled! You know you have been using a plentiful amount of hot peppers in your cooking when you begin receiving emails from concerned parties regarding the state of your stomach lining. I'm not worried in the least about my stomach's lining, but I am worried that I might be addicted to hot peppers! They make everything better, don't they?! Before I get to the recipe, I feel I should share that I laid my tired post-workout body on the sunny and very warm ground this afternoon in the very spot where a giant Yard Glacier stood mere weeks ago. Spring is finally here and I absolutely could not be happier about that. Spring is finally here! Onto the salmon! This was seriously yummy and it could easily be grilled instead of baked. May as well grill while the grilling season is here! Place a 1-pound salmon fillet into a shallow baking dish. Stir the marinade ingredients around and heap everything on top of the salmon fillet. Preheat your oven to 350 degrees F (or light your grill). Pour the marinade into a small saucepan, leaving the salmon fillet in the baking dish. 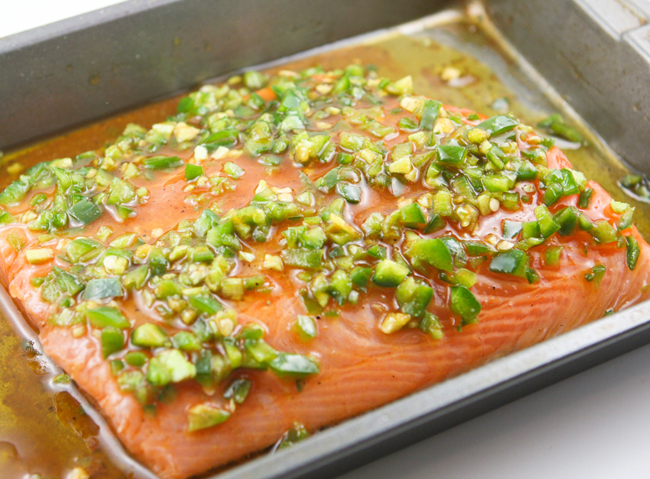 Bake the salmon in the preheated oven for 20 minutes, or until the fish is cooked through. Bring the contents of the saucepan to a boil over medium heat. Reduce to a simmer and cook, stirring occasionally, for an additional 10 minutes. Drizzle the warm glaze over the cooked salmon and serve! Soooo good! I'm off to enjoy a little bit o' spring with my cuties! This is my new favorite way to prepare salmon. A hint of spice makes everything better! Place salmon fillet in a shallow baking dish and set aside. In a small bowl, combine the hot sauce, honey, olive oil, jalapeños, salt and pepper. Mix well and pour over the salmon. Cover and refrigerate for 6 hours. Preheat oven to 350 degrees F. Pour the marinade into a small saucepan, leaving the salmon fillet in the baking dish. Bake the salmon in the preheated oven for 20 minutes, or until fish is cooked through. Bring the contents of the saucepan to a boil over medium heat. Reduce to a simmer and cook, stirring occasionally, for an additional 10 minutes. Drizzle the warm glaze over the salmon and serve!